An easy recipe for crisp-skinned, golden chicken simple enough to make on a weeknight. 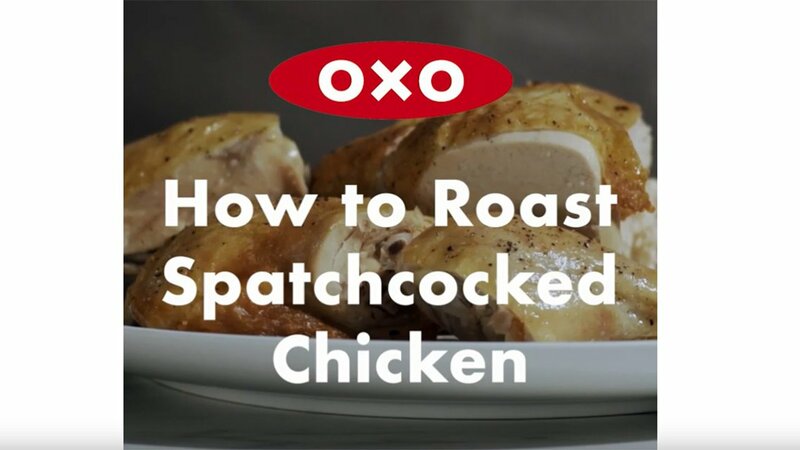 Tips for how to roast a spatchcock chicken and an easy recipe for crisp-skinned, golden chicken simple enough to make on a weeknight. Chances are, this is not your first roasted chicken, but it may soon become your standard. “Spatchcock” is fun to say. It means “butterflied” and describes a whole bird with its backbone removed so that it can be flattened out. It makes chicken taste good. Pinch salt with five fingers and sprinkle evenly about four times so that salt is part of every bite. If you have time, dry the spatchcocked chicken. Put it on the sheet pan loosely covered with wax paper in the refrigerator for a day or so after salting. Save the oil for later. If you have 30 spare minutes before dinner, remove the chicken from the fridge to take the chill off. This chicken should be pretty flat. Press down on the breast until it breaks. Then press some more to get it really flat. High-heat roasting is perfect for a flat chicken. Ovens lose heat quickly, so when you check the temperature of the chicken, open the oven door, put the pan on the counter, close the door, and take the temp. This is sort of tricky, so check the temperature after 35 minutes. It may take a while longer to cook depending on the size and shape of your chicken and actual oven temperature. The USDA recommends cooking chicken to 165°F for safety, but the temperature will continue to rise when the chicken is out of the oven. For taste and juiciness, some chefs cook chicken to 155°F at the center of the breast. Because broth is easy and saves money. Save the spine and wing tips to make stock by simmering in 4 cups water with a cut up onion, sliced carrot, 2 stalks celery and a bay leaf for 1 to 4 hours. Strain and freeze. The beauty of a basic recipe is that it begs to be customized. Substitute butter for oil. Rub grated garlic, fresh thyme leaves, chopped oregano, paprika or cumin powder to the skin. Roast on a bed of lemon slices or sprinkle with chopped rosemary or sage. Brush with barbecue sauce halfway through the cooking, or keep the ingredients as is and grill on a banked fire, adjusting the time to your grill’s heat, and only flipping for a few supervised crispiness minutes. Preheat the oven to 450°F. Remove the backbone with sharp shears and set aside for another use. Open and liberally sprinkle the underside of chicken with salt and pepper. Flip it breast-side up and press down to flatten the breast until it pops. Remove the pointed wing tips at the first joint. Slip your fingers under the skin of the breast from the bottom to separate it from the meat. Season under the skin with some of the salt and drizzle in some oil. Season the outside of the chicken skin all over, taking care to season the wings and thighs with more salt and pepper, and drizzle with remaining oil. Put chicken on the rack skin-side up with the legs forward. Slide the chicken, legs-first, into the oven and roast until the breast reaches 155ºF, about 35 to 45 minutes. Check the temperature with a thermometer inserted into the center of the breast without touching bones. Transfer to a carving board, and let cool 15 minutes before carving to let the juices thicken and redistribute. To carve, cut the skin between the thigh and body. Flip chicken over. Slice at the seam to separate the thigh from the drumstick. Repeat with the other leg. Remove wings by cutting down the breast through the shoulder joint, leaving some of the breast attached to the wing. Cut the breast in half and then in quarters. Arrange chicken pieces on a platter and garnish with lemon slices. Season with salt and pepper and another drizzle of oil. I think I would like to try this on my grill. What would you recommend cooking it at a low temperature . Hi Sal – The chicken should be roasted at 450°F for 35-35 minutes. We’ve updated the recipe to include this.